Another day, another high-level White House departure. Brace yourselves, this story gets messy. 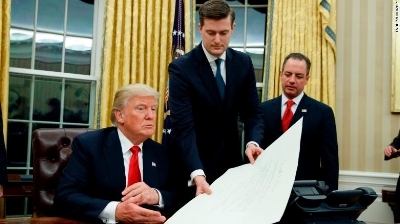 White House staff secretary Rob Porter is stepping down from his post following abuse allegations from two of his former wives. Porter, who before was widely unknown by the public, played an influential role in the White House and was at Trump's side daily. Holderness then details the abuse took a turn for the worst, as Porter took to choking her and pushing his limbs onto her body in anger. Willhougby, Porter's second wife, also detailed the abuse and trauma that he put her through throughout their marriage. Willhougby says Porter abused her both verbally and physically. Willhougby described a particularly gruesome incident to CNN, "I took a shower and Rob followed me fairly shortly after and grabbed me from the shower by my shoulders up close to my neck and pulled me out to continue to yell at me." The details of Porter's abusive behavior leaves the question: who in the White House knew about his documented domestic violence? Porter enjoyed an elite role in the White House and served as a close confidant to Donald Trump. CNN has reported that high-level officials in the White House, like chief-of-staff John Kelly, knew about the abuse allegations for months and scrambled to protect him. The White House statements in response to the allegations are now coming under fire after reports that White House communications director Hope Hicks, who is dating Porter, had a role in drafting the glowing statements. The Porter certainly controversy leaves a lot of questions unanswered, and many Americans want to know who knew what and when they knew it. The whole situation is messy, chile.